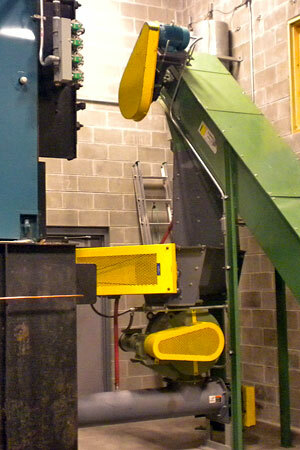 TS Manufacturing has been providing custom Boiler Feed Systems for over 40 years. Our knowledge & experience in large and small systems allows us to design and build the right solution for you. Whether you need a Reclaim & Silo Solution, Stoker Floor Pile Reclaim, or a Travelling Screw Reclaim System, we have the experience and facilities to design exactly what your system requires. These systems allow a large amount of material to be efficiently stored and metered into your boiler system. These can be fed by Truck Dumping Systems (available with integrated screening) or Loader Systems depending on the requirements of the project. 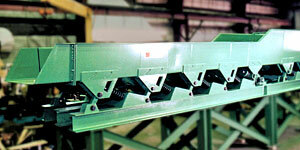 Reclaims are available in Truck Receiving, Multi-Chain or Belt Style Systems designed to match your needs. Vibrating Conveyors, Belt Conveyors, Flexi-Wall Belt Conveyors, Screw Conveyors, Chain Conveyors, Paddle Style Conveyors and Pneumatic Systems. All of these can be paired with Size Check Screening to ensure consistent material feed. 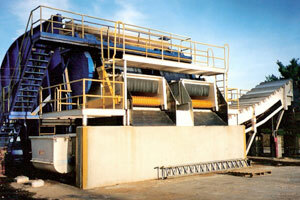 These screening systems include: Rotary Screens, Disc Screens, Vibrating Screens. Stoker Floor Reclaims offer the many benefits of scale pile reclaiming, with minimal maintenance. These 'Stoker Floor' or 'Ladder Floor' Systems can sustain enormous piles in covered or open air environments. With the addition of the Dust Shroud and Lump Breaker, these systems allow increased uptime and flexible pile sizes. The rugged construction of these Active Floors allows you to size the pile significantly larger than the Active Floor Area. 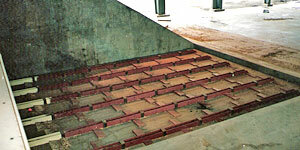 Driving on top of the floor system, for pile reshaping, is common. To ensure a steady supply of material, each Boiler System requires a metering bin to handle Feed System surges. 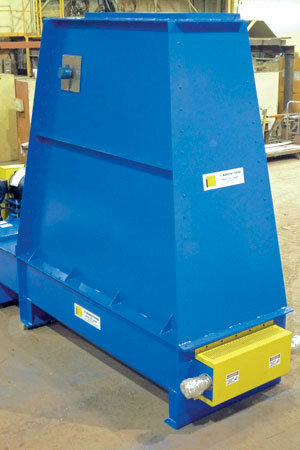 These bins are custom designed to meet the specifications of your project, and can handle the high temperature environments within the boiler room. The Travelling Screw Reclaim allows piles to be actively reclaimed without the need for hydraulics. These Travelling Auger Systems allow the active reclaim area to be increased without a significant increase in reclaim costs. The Screw System traverses under the pile, removing the material as requested by the Boiler Feed.